Memorable 4D3N tour in Jeju! The best planned trip is always one that is least planned. However, that’s only true if you have the help of a great tour company which is professional, experienced and passionate. I am glad I have engaged Core Travel which I stumbled across on the Internet. We decided to visit Jeju, as we wanted to take a look at the different hotels for our destination wedding in Jeju in 2017. It was such a last minute decision but we were lucky to have found Core Travel. Jin was quick in his responses and all arrangements (hotel, airport transfer, itinerary etc) were settled within 2 days! I was impressed with the efficiency! Throughout the entire trip, Jin took good care of us and my mum had a really good time in Jeju. We specially love the local cuisine recommended by Jin, so much so that we couldn’t stop talking about it after the trip! I also appreciate the flexible and thoughtful arrangement made for us. Everything went on so smoothly! We managed to visit all the hotels we planned to see and even had spare time to do some shopping and simple sightseeing. I wish we have more time as there is still so much more to explore in this beautiful island! I will be visiting Jeju again very soon this year to prepare for my wedding (yes, I managed to find the hotel I want!) 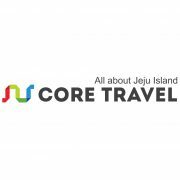 and Core Travel will be definitely be my choice for our next Jeju tour! Thank you again Jin, Hank and Zhang! See you soon!